We are the premier providers of high quality MIFARE® cards in the Indian subcontinent. These contactless smart cards are ISO/ IEC 14443 compliant, operate on 13.56 MHz frequency. These smart cards have some memory to store data, which differs in different variety of these cards. 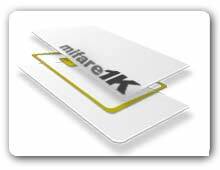 We offer all the variants of MIFARE® cards such as: MIFARE® Classic , MIFARE® Ultralight and MIFARE Ultralight® EV1, MIFARE® Ultralight C, MIFARE® DESFire® , MIFARE® DESFire EV1, MIFARE® Plus and MIFARE® samAV2.